War zones and authoritative states have one thing in common: the tendency to control media and journalists. Pakistan is neither a declared war zone nor an authoritative state, but the past few years have seen a significant rise in attacks, intimidation, and threats to media houses and journalists working in the country. Recently Geo TV, the most popular news channel in Pakistan, was taken off-air. Prominent journalist Taha Siddiqui was threatened and nearly abducted, and some social-media bloggers were kidnapped, allegedly by state agencies. Advocates of press freedom argue that, by using these threatening tactics, the military and intelligence agencies are attempting to censor messages about Pakistan. Strangely, almost all criticisms of the state’s tactics and methods do not address why the military and intelligence agencies are doing this and, more importantly, why now. The number of terrorist attacks in Pakistan has gone down, the country’s security situation has improved, its economy is doing better, and there is general optimism about the country’s future. The answer to why the military and intelligence agencies are cracking down on the media rests is provided by the institutions themselves. I had a chance to interview some officers during my PhD research in 2016, and their views were revealing. At the core of problem, they said, are two issues: first, the way the Pakistani security establishment perceive threats; and second, its view of press and journalism in light of its recent experiences with the media. Almost everyone I interviewed, including senior and mid-ranking officials in the security establishment, saw the internal threat emanating from within Pakistan as a primary national security concern. It is taken more seriously than the threat from India, Afghanistan, or the US. More importantly, they referred to threats presented not only by local terrorists but also from within the sacred institutions of media, development, and human rights. One of the military generals I talked to put it bluntly. “Nations rarely collapse from an outside invasion,” he said. “They almost always collapse from within.” In his view, not all threats are in the form of “suicide attacks or bullets” – some attacks with long-term consequences come in the form of “words and writings”. This view suggests the Pakistani security establishment would prefer to monopolise discourse about the country. And it appears that the process of achieving this goal started after 2013, when the notable journalist Hamid Mir was shot by gunmen in the city of Karachi. Mir survived the attack, but shortly afterwards Geo TV ran a malicious campaign against Lieutenant-General Zaheer-ul-Islam, then chief of Pakistan’s Inter-Services Intelligence agency, claiming that he was responsible for the attack. The allegation sent a shock wave through the security establishment. To demystify Pakistan’s censorship drive and understand the current situation and context, one cannot look at it through a Western lens. Pakistan is still a relatively young country, struggling to survive economically and fighting the US-led war on terror. It has border disputes with both India to the east, and Afghanistan to the west. More recently, Pakistan has been the subject of a large-scale US covert war. The secret US raid to take out Osama bin Laden; the CIA’s running of a fake vaccination campaign in the tribal areas of Pakistan in order to locate the leader of al-Qaeda; and the killing of two people by CIA contractor Raymond Davis, in broad daylight on a busy main road in Lahore, makes the security establishment wary of both development aid workers and journalists. In this context, the security establishment suspects that information warfare is being waged against Pakistani journalists and media houses consciously, and in some cases unconsciously, to peddle a view of the country and its agencies as sponsors of terror in the region. The security establishment in Pakistan is pushing for top-down censorship and media reforms they do not see occurring otherwise. 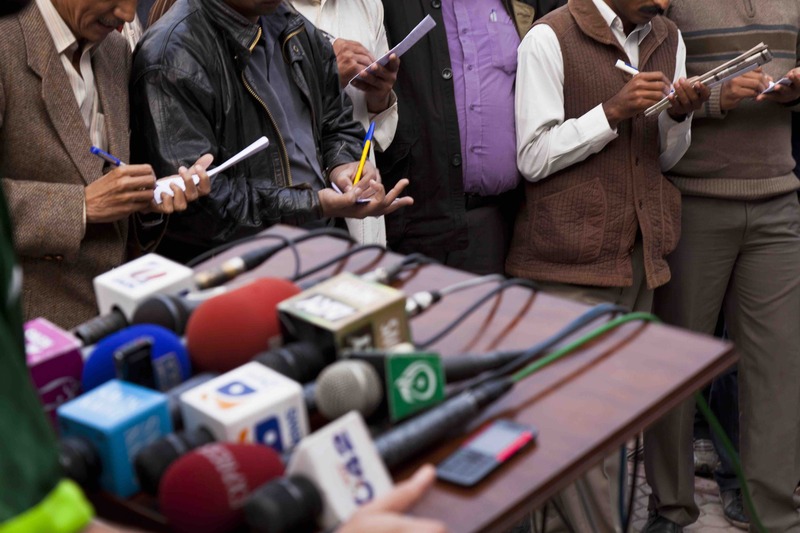 While media in Pakistan has played both a positive and negative role in the country, there is no denying that the media is in desperate need of reform. For instance, while media helped bring down military dictatorship in Pakistan, it also amplifies hate against minorities in the country and has led to several deaths and violent incidents. In Pakistan’s murky political waters, while media is reluctant to pursue internal reforms and abide by the ethical code of journalism, the state has taken upon itself to enforce censorship. But perhaps a different method to achieve media reforms might work better than brute force. An ex-army general poised to become prime minister and a junta-manipulated constitution has many Thais fired up.